Come and join us on a Spanish course in San Sebastian, where you can experience a wonderful combination of both Spanish and Basque culture. Set on a sandy horseshoe bay on the northern coast of Spain, the city of San Sebastian boasts stunning golden beaches and, with excellent surf conditions all year round, is every surfer’s paradise! San Sebastian is not just sparkling waters and golden sands - it is also a beautiful city of narrow streets, restaurants, bars and with a charming historic centre. The city is also an ideal base from which to explore the scenery of Spain’s northern coast and the Pyrenees Mountains whilst learning Spanish at our school. Our Spanish language school finds itself just 10 minutes from the city centre and Zurriola beach. It is comprised of 17 air-conditioned classrooms, student common room, multimedia room with computers and free Wi-Fi access, student cafeteria and a large terrace, where students meet at break time and after their Spanish course. Our school in San Sebastian offers a wide range of Spanish courses, including an Intensive Spanish course of 20 lessons per week and a combined course of Intensive + Private Lessons, combining 20 group lessons 5 weekly Spanish lessons. If you would prefer more flexibility, why not consider a course of Private Lessons only? This is a great way to improve at a fast rate and focus on any areas of weakness you may have. We also offer an Intensive + Mini-Group course, allowing you to combine 20 weekly group lessons with 10 additional lessons in smaller groups. Not only do we offer Spanish courses in San Sebastian, but you can also learn to surf! Our Intensive + Surfing surf combines the 20 weekly Spanish lesson with 5 surf lessons per week. Or, if Spanish cuisine is more your thing, you can even take an Intensive + Cookery course. While on a Spanish course at our school in San Sebastian, you can stay with a local host family, where you will be sure to have a fully immersive experience! Alternatively, if you would like more independence during your stay in San Sebastian, we also offer Student Residence and Shared Apartment accommodation. Take part in the school’s activity programme, where you can practise Spanish, experience local culture and make friends from all over the world! Activities on offer do vary, but may include things like international evenings, city tours, wine-tasting, film evenings, parties and excursions in and around San Sebastian. he nearest airport to our Spanish language school is Biarritz. Transfers to San Sebastian can be arranged from Bilbao, Biarritz or San Sebastian airports, or from Irun/Hendaye station. Average score for our school in San Sebastian based on 37 previous client reviews. Liked the way to teach. I learnt a lot. I enjoyed my course it was very helpful and moved at my pace most of the time. My professors Ester and Maria were great and very helpful. I enjoyed going to class every day. My accommodation was great the host family I stayed with were lovely and Mikele was always making sure we were ok and if we needed anything,I would highly recommend the host family. The only thing I would change would be to eat with the family to have that expedience, to talk and to eat. But apart from that my experience was wonderful and I hope to return soon. was perfectly equipped for private study. Clean, well appointed flat within walking distance of the school. Spanish family were extremely friendly and cooked well. I really enjoyed my course. The staff were very friendly and very helpful during the class. However I would say that the school wasn't as flexible as some other schools - you could not change classes as easily as I know you can at other schools. The flat that I stayed in was quite nice and very central. The land lady was very kind and happy to speak with me in my terrible Spanish!!! 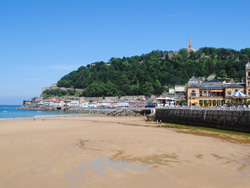 San Sebastian is a beautiful city with a great beach to walk along for some beautiful views. There were quite a few school led activities to do around the town. Teaching was generally good, The one-to-one sessions were particularly excellent, the post-class activities were useful in helping get to know other students and the city. The accommodation was basic but comfortable, friendly, reasonably well-located. Good value considering it was high season. I found the school very friendly and efficient. The accomodation was in a spacious flat right in the centre of the town, 5 minutes from the beach, 10 minutes from the old quarter and 15 minutes from the school. My room was clean, larger than expected very bright and cheery.Very sunny. The course was a great expereince because it allowed me to meet many fun people!! I had a host family who were very friendly and welcoming! It really helped to try and practice what I had learnt during the day with the family. It helps if you do the activites the school offers because it's a quick and easy way to get to know people. I did the intensive + 5 course and it was perfect for me. We went at a great pace and had a really fun atmosphere in the classroom, and the individual lessons allowed me to tailor what i wanted to do which was important as i was only there a week. the teachers were fab. I was so lucky with my host family who were kind, attentive and full of advice to an extent way beyond the call of duty! there were very patient with me attempting to string together sentences and even drove me to the station when i had to go home! Excellent teachers who explained well, kept a good rhythm to the class and created a good atmosphere. Probably the best foreign language teachers I've had (and I've been to quite a few language schools). Accommodation in a great location, clean room and friendly host. Thanks for arranging the course at the last minute for me. The course was great, all the students and teachers were all so friendly. Class sizes were small which was very good and the teachers were excellent and I learnt a lot with them. Our apartment was very spacious and in a great location. Our host woman was so friendly and always helped us if we had any difficulties. It was a great way to experience Spanish culture and I really enjoyed my stay. I like the quality of the teachers at the Lacunza School. The placement test is well done and leads to small homogenous groups. I would like to do another course there. Accommodation was nice, in the middle of old San Sebastian. Host lady was 73 years old, but very energetic and friendly! Really good teaching on the teachers' course - very inspiring and gave me lots of ideas. Also good for my Spanish (which is my 4th language!) Good - nice apartment. Flat mates were really nice but found the age difference more difficult as they wanted to go clubbing every night! However, I also got to speak loads of French with 2 of them which was good, but maybe better for my Spanish if I had stayed with a native speaker. San Sebastian is an amazing place! A great life experience! The classes were enjoyable and useful. The teachers were friendly and well trained. My family were perfect and the location too. I enjoyed all the classes, the teachers were knowledgable and dedicated and the staff were friendly and always helpful. I stayed with a host family and they were wonderful. I always felt safe and comfortable. We got along very well. San Sebastian course was an amazing experience. My spanish improved so much and I felt I learnt the necessary areas. As well as that, I made so many friends from all over the world! My host family have to be the best host family in the world! They were very kind and we learnt alot from talking to them at home. I learned more in the last month in Spain than i have in at least the last two years of school in Ireland. The classes were brilliant and the teachers were lovely. I was very impressed with my accomadation; the house was perfect, the family were very warm and welcoming, I learned a lot from them, and the food was excellent. I couldn't have asked for more. I only studied at the school for one week, but I found just what I was looking for. A range of interesting lessons at the right level for me and some friendly, lively teachers. This is a great way to visit spain and I will do it again. The course is really personal and especially the private courses are really helpful. The accommodation was good and it was nice to taste the real Spanish dinner. I love San Sebastian!! Very enjoyable - learned a lot and the classes were well prepared and structured. Lots of talking in Spanish which also helped to improve my skills. The course was good, with a careful initial assessment and placing in the right class. All teachers were good and clearly communicated with each other between classes. My hosts were welcoming and charming. San Sabastian is a wonderful city.